Saturday July 18th 1896 It was raining when we woke this morning and it kept it up the greater part of the day. I wrote letters all the forenoon. I did a little baking after the dinner was over and was out looking after the chickens. We had work to keep some from drowning. I read and wrote in the evening. 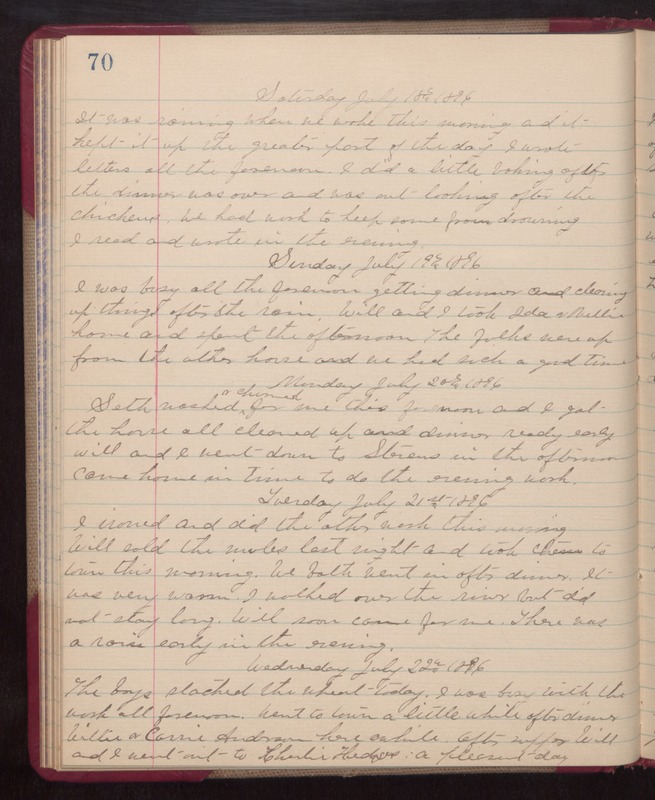 Sunday July 19th 1896 I was busy all the forenoon getting dinner and cleaning up things after the rain. Will and I took Ida & Nellie home and spent the afternoon. The folks were up from the other house and we had such a good time. Monday July 20th 1896 Seth washed & churned for me this forenoon and I got the house all cleaned up and dinner ready early Will and I went down to Stevens in the afternoon came home in time to do the evening work. Tuesday July 21st 1896 I ironed and did the other work this morning Will sold the mules last night and took cheese to town this morning. We both went in after dinner. It was very warm. I walked over the river but did not stay long. Will soon came for me. There was a rain early in the evening. Wednesday July 22nd 1896 The boys stacked the wheat today. I was busy with the work all forenoon. Went to town a little while after dinner. Willie & Carrie Anderson here awhile. After supper Will and I went out to Charlie Hedges. a pleasant day.